Broughton in Furness is a small market town on the south western boundary of England's Lake District National Park. 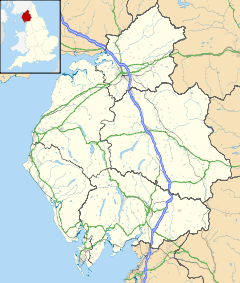 It is located in the Furness region of Cumbria, which was originally part of Lancashire before 1974. Broughton is mentioned in the Domesday Book as one of the townships forming the Manor of Hougun held by Tostig Godwinson, Earl of Northumbria. Dating from around the eleventh century, the original settlement grew to become the local market town for both fishing and agriculture. Wool was particularly important for the town's development. The town was given a charter in 1575. Market Square was formally laid out in 1760 by John Gilpin Sawrey, the Lord of the Manor, who lived at Broughton Tower,a large mansion just a short distance from the Square. In the 1990s the A595 road was diverted in an attempt to improve the environment of the town and help it retain its rural feel. With Cumbria having retained its two-tier local authority structure, Broughton is located within the Cumbria County Council and the South Lakeland District Council areas. In 1976 the parishes of Broughton West, Seathwaite with Dunnerdale, and Angerton were merged, creating Duddon Parish Council. It lies near the River Duddon, just inland from the coastal hamlet of Foxfield. Duddon Mosses is a site of special scientific interest with deer, lizards, adders and barn owls. With just 529 residents, in terms of population, Broughton-in-Furness ranks 7721 of the 7727 towns in the UK according to the 2011 census. Traditionally the economy was based on fishing and agriculture; there is a regular livestock market. The creation of the National Park in the 1950s produced some tourism for the area, though most tourists still head further north or east into the central lakes. There is a Tourist Information Centre located in the main square. The Victory Hall has been recently refurbished with Lottery funding and puts on plays and musical events. The town contains, amongst other shops, a Post Office/newsagents, a grocer/butcher, a bakery and a number of pubs/restaurants. The central obelisk in the town square was constructed to mark the Jubilee of King George III in 1810. Syke House on the western approach is an attractive listed building with datestones of 1655 and 1740. There is a thriving tennis club with two outdoor courts and there is sailing on Coniston Water. Eccle Riggs is a Victorian manor house to the south of town that is now a leisure club. In 1859, the Coniston branch of the Furness Railway, which passed through the town, was opened. Nearly one hundred years later, in 1958, the line was closed and dismantled, and the cleared ground is now a public bridleway. Broughton's nearest railway station is now Foxfield railway station, 2 miles (3.2 km) south west of the town. The main west-coast road, the A595, used to pass through Broughton until the road along Duddon Mosses through Foxfield was designated as the A595. The stretch of road through Broughton has been designated the number C5009, although A595 can still be seen on older road signage. There is a Church of England primary school in the town. The old school house, now a private residence, can still be seen on Church Street, close to the pathway to the church. There are no secondary schools in Broughton with children usually attending John Ruskin School in Coniston, Ulverston Victoria High School or Windermere School. Young people frequently travel to Barrow-in-Furness to attend Furness College and Barrow Sixth Form College from the age of 16. The Anglican church dedicated to St Mary Magdalene has its roots in Saxon times but the oldest part of the current building dates to the 12th century. It is an active Anglican parish church in the deanery of Furness, the archdeaconry of Westmorland and Furness, and the diocese of Carlisle. Its benefice is united with those of four other local parishes. The church is recorded in the National Heritage List for England as a designated Grade II listed building. Richard Parsons is the author of a series of best-selling GCSE study guides, making him the fifth best-selling author in Britain in the first decade of the 21st century. Sir Robin Philipson RA (1916–1992) was born in the town. ^ "About Our School". Broughton-in-Furness CE Primary School. Retrieved 15 January 2017. ^ Patrick Sawer and Rebecca Lefort (13 December 2009). "Surprise as little known author ranked among most successful writers of past decade". The Daily Telegraph. Retrieved 13 December 2009. Wikimedia Commons has media related to Broughton in Furness.